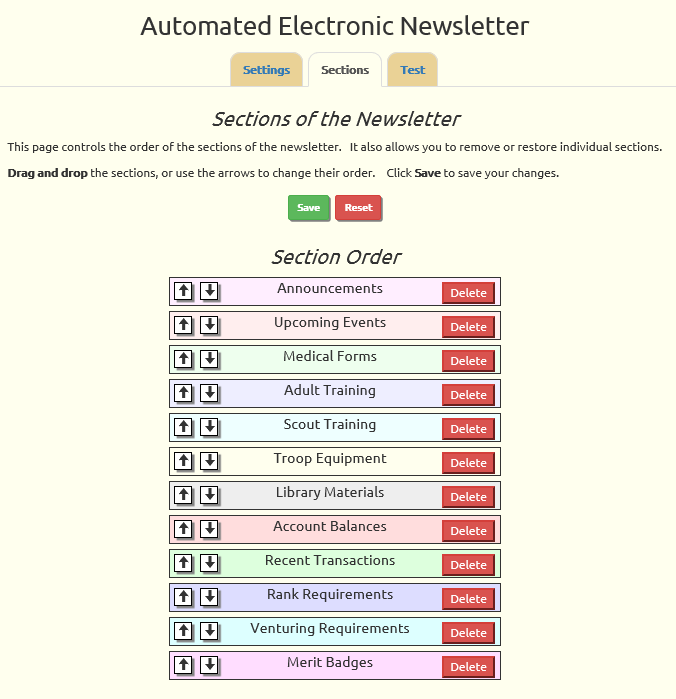 You can now control the order of the sections on the electronic newsletter, and remove sections that your unit doesn't need. This can be done from a new tab on the Automated Newsletter set up page, as shown below. Scout Training will list those courses that have expired or are about to expire for scouts who receive the newsletter. Recent Transactions will list recent monetary transactions on the recipient's account. Venturing Requirements will appear for scouts in the Venturing program, and will list the requirements needed to earn the next Venturing rank. The Upcoming Events section now includes the planned activities for all events. If there is a sign-up start date that is in the future, it will be shown. If sign-ups are in progress and there is a sign-up deadline, the deadline will be shown. The biggest change is the overall appearance of the newsletter, which has been reworked to look great on mobile devices as well as on larger screens. Here is an example of what it can look like on a narrow screen. Boy Scout troops preparing for fundraisers with shifts can now make sure everyone is doing their part by running the new Family Shift Participation report, which is available from the Troop Calendar on events that have shifts. For each scout it shows how many shifts he has signed up for and how many shifts his parents have signed up for. It includes contact information so you can easily get in touch with those who still need to participate. The Check-In / Check-Out pages for both equipment and library materials now have a History button next to each scout's name that will display a complete record of every item they've ever checked out. This new screen is available in all versions of TroopWebHost. The e-mail relay capability that we announced in June now logs each relayed message to your site. This includes the subject line and the list of recipients in your unit.